How long did you spend rearranging annotation on your last project? Sometimes those seemingly little 'spit & polish' tasks eat an enormous amount of time! On a large project you will spend at least a couple days just dealing with annotation overlapping each other, blocks, and architectural features. You probably have choice words for the times when you spent many hours cleaning up annotation only to have the architect rework the entire project, forcing you to move most of your devices and deal with annotation overlaps again. Wouldn't it be nice to cut annotation clean up time down to 1/100th or so of what it takes you today? With DraftLogic Electrical, you can do exactly that! 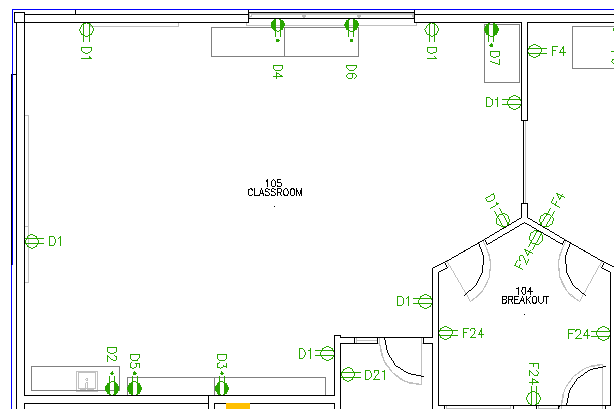 The Annotation Organizer function will go through your project symbol by symbol and move the annotation for each symbol into a location that does not conflict with other objects that will be plotted to the same sheets for your clients. The few locations where satisfactory locations could not be found will be marked for your review. You can run the Annotation Organizer on as few as one symbol or as many as the entire project contents. Depending on how many symbols you have selected for the Annotation Organizer to run on, all of the annotation will be moved to best possible locations within seconds or minutes. The Annotation Organizer is both smart and flexible. You have the choice of orienting annotation for wall mounted devices to the same orientation as the device or keeping such annotation horizontal. When you do orient annotation to match device rotation, you have the option of running the text toward the top or bottom of the plot. 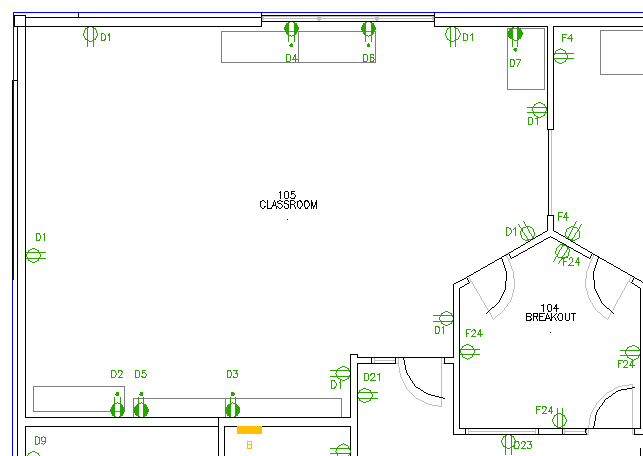 Also, you can have the Annotation Organizer look for surfaces away from the room inner perimeter to use as orientation references, so the orientation for receptacles mounted on walls in the middle area of a space can still be auto-oriented to match the receptacle rotation angle. Finally, you choose whether to have the Annotation Organizer make best efforts to also avoid annotation collisions with xref'd entities or not. The Annotation Organizer Settings dialog puts you in complete control. Use one of our supplied set of template values, create your own reusable templates to share with everyone using DraftLogic Electrical in your office, or select one-time use values. You select the symbols for the annotation organizer to act upon, the size to change the annotation to, and some tolerances for how close you want to allow the annotation to be placed relative to the parent symbol and to other annotation from the same symbol. You also specify the buffer distance you desire between the annotation and any drawing elements that should be considered & the DraftLogic Electrical Annotation Organizer makes best efforts at finding an annotation location that fits your requirements. You can have switch ID's run with different settings than all other annotation if you want, for example you might want the switch IDs to be placed closer to each other and their parent symbol than you would like other symbols' annotation to be placed. Starting to the right and proceeding down from there is a series of screen captures from the same room, first showing how the annotation looks before the Annotation Organizer is used. To the right are the luminaires and their annotation before the Annotation Organizer is run. Note how the circuit numbers and switch IDs are spread apart and how there is the occasional overlap with walls and also with the architect's ceiling plan. Here's the receptacles and their annotation before the Annotation Organizer is run. Note how the circuit numbers are located inconsistently versus the parent symbol and how there is the occasional overlap/snug placement with walls and counters. Let's see how things look after running the DraftLogic Electrical Annotation Organizer. This time, we will specify that all annotation should be horizontal. First, the results for the luminaire annotation. Now the circuit number and switch ID for each luminaire are grouped with the parent symbol. Annotation has been placed to not overlap architectural features like the walls, windows, doors, and the architect's ceiling plan. To the right we see how the receptacles look with all annotation forced horizontal. Now the circuit number for each receptacle is grouped with the parent symbol. Annotation has been placed to not overlap architectural features like the walls, windows, doors, and counters. 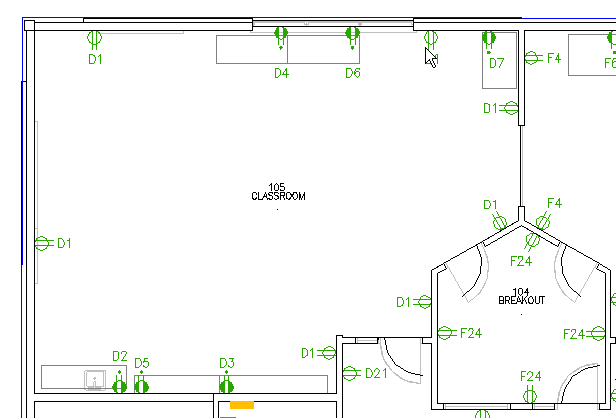 Running the Annotation Organizer with the option of matching the annotation angle with any wall mounted device's angle gives us what we see to the right. The annotation is forced 'plan readable' so will not orient upside down, but otherwise matches the parent symbol's angle of placement. This method of placing annotation is a more efficient use of floor plan space but is harder to read than having all annotation be horizontal. With the DraftLogic Electrical Annotation Organizer, it is your choice as to how wall mounted symbol annotation is shown. Since it takes only minutes to run for each set of hundreds of symbols, try it a few different ways to see which you like best. One other option is to orient the annotation to parent wall mounted symbol angle, but to have annotation for near vertical parent symbols (i.e. N-S pointing) to have their annotation be forced horizontal. See the results of this option to the right. As with all our reports, schedules, and symbols, the device symbols and annotation are standard AutoCAD blocks and attributes. This means that if you do not like what the Annotation Organizer has done in a particular circumstance, you can still move the annotation (aka visible attributes) like you do today by clicking and dragging the attribute insertion point. Do you have some areas that are going to plot at 1:100 or 1/8"=1' and others at 1:50 or 1/4"=1'? No problem! 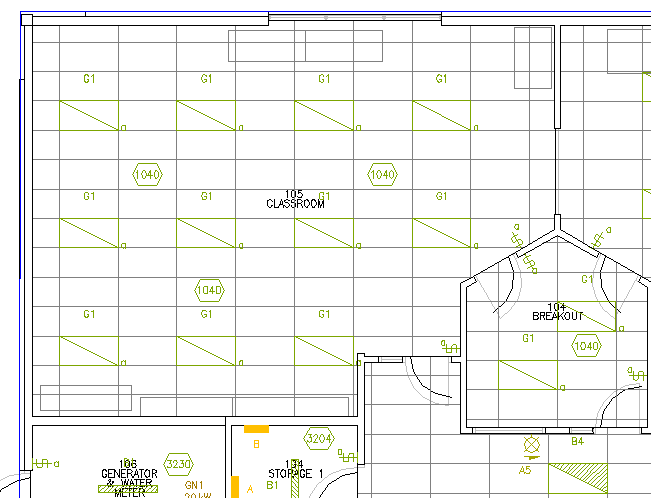 All DraftLogic Electrical symbols and annotation are standard AutoCAD entities, so you can scale the blocks for an area to whatever different size you want them relative to those in the remainder of the project. If you want the symbols to stay as is, you can also run the Annotation Organizer with the settings you desire for the 1:100 or 1/8"=1' areas and then run it again with changed settings for the 1:50 or 1/4"=1' areas. Or perhaps you want to plot the whole project together but just deal with annotation congestion in a specific area. 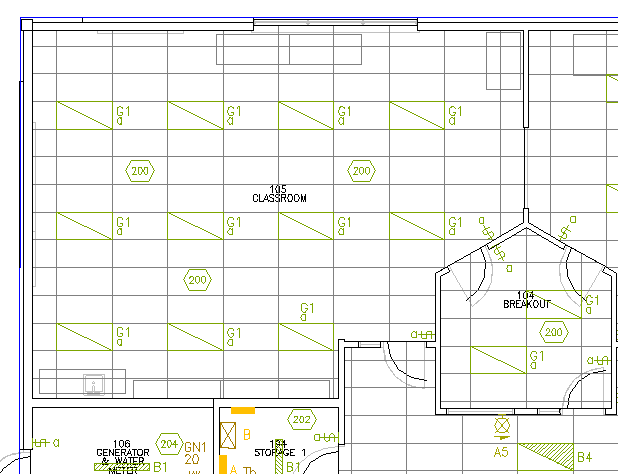 Below, for example, we have a congested kitchen where the user didn't want to create a differently scaled plot so instead used the Annotation Organizer to just down-size the annotation in the kitchen by 25% versus the less-congested areas of the drawing. 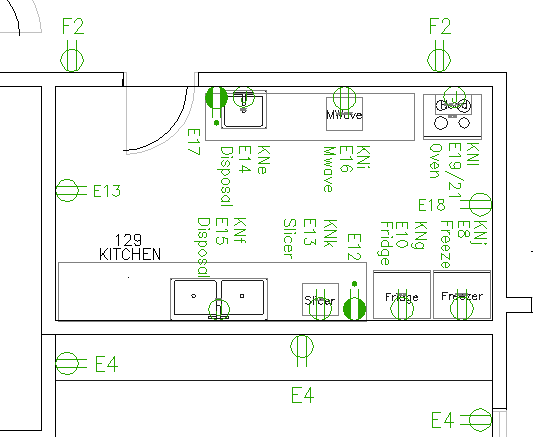 To further make efficient use of the limited area available in the kitchen, the user opted to have annotation in that area run in the same direction as the wall mounted devices. Want to Know More About the Annotation Organizer? See our forums entry with all the detail about the Annotation Organizer.